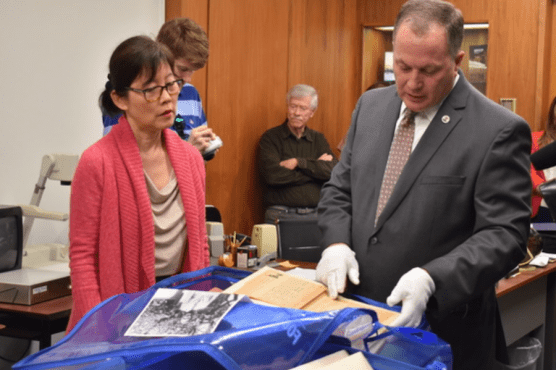 In a small library, deep in the basement of the Los Angeles County Hall of Administration, Assessor Jeffrey Prang discovered 20 historic journals that will now become part of the collections at the Natural History Museum of Los Angeles County (NHM). Dating from 1934 to 1951, the red-covered journals are packed with a remarkable collection of handwritten notes, newspaper clippings, Assessor related documents, and personal mementos. These were all compiled by the late D.G. Cathcart, Chief Personal Property Appraiser and Pasadena resident. Once the preservation process is complete, the journals will be available to view by appointment at the NHM’s Seaver Center for Western History Research Center.